Thanksgiving is a time for celebrating everything and everyone that makes us feel so #blessed all year — but instead, we usually spend it at awkward family gatherings, trying to convince Aunt Jeannie that writing is a real job. Whether Friendsgiving is your Thanksgiving this year or if you’re throwing two feasts (two dinners = more hostess gifts = win), here’s how to throw a Friendsgiving that becomes the only festive yearly tradition you won’t need to pregame to get through. Ideally, you should send out invitations a few weeks before the event before. And yeah, that means we probably should’ve posted this article sooner, but like you, we’re the queens of procrastination. If you’re planning last minute, find a date that works for you and your closest friends – you know, the ones who never bail and are fun enough to carry the whole night even if no one else shows. Then send online invitations to the rest of your crew via Evite or Paperless Post. Look, Ms. Type A.: We know you can totally handle carving a turkey, arranging a cheese board, baking a pie, prepping the stuffing, mashing the potatoes, and cooking a casserole on your own! Wine makes everything possible. Here’s a tip: DON’T. Your friends are already wondering what to bring for Friendsgiving. You should deal with the turkey, since that has to go into the oven a few hours before the party starts. Put your punctual friends in charge of appetizers, and your habitually late friends in charge of desserts. If you have a friend who’s an amazing cook, put them in charge of stuffing or mashed potatoes — those are make-or-break sides. If you have a domestically challenged friend, they can bring the heat-and-eat biscuits and the wine. Even if they bring bad wine, after two glasses, no one will notice. Don’t get fancy with the turkey. If you’re never cooked a turducken or used a deep fryer before, don’t use your party as a test lab. 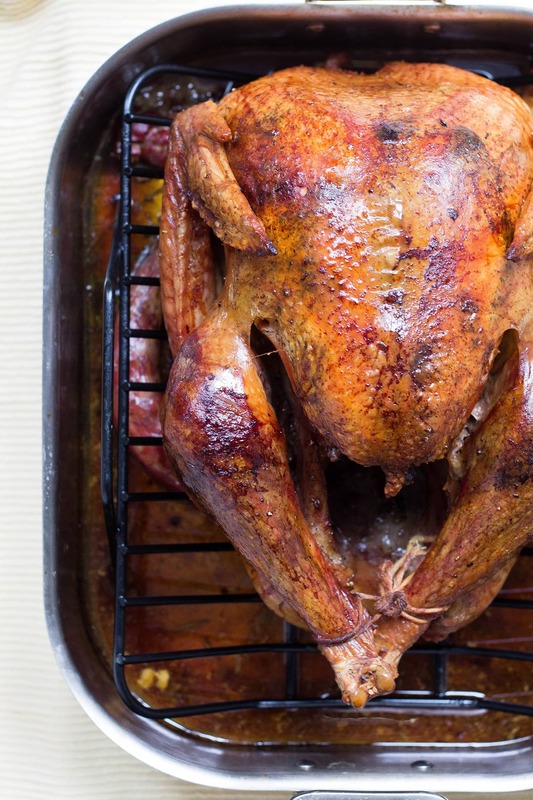 Stick with a tried-and-true roasted turkey. Unless you really need the insurance money. Feed your vegan friends too. Turkey, mashed potatoes, buttery biscuits, creamy casseroles — Thanksgiving literally revolves around meat and dairy. No complaints from us. What’s that arteries? Not another plate? Well, we’ll show you who’s boss. Make sure your vegan friends (and your gluten-free friends, and your lactose-intolerant friends, and your friends allergic to air) have something to eat besides applesauce. Buy extra serving spoons and ladles. While you’re at it, also pick up a decent carving knife, a proper serving tray for the turkey, and a gravy boat. Oh, and can you pick up some eggs and milk for us? And maybe a kombucha? Love you! Don’t screw up the booze. It doesn’t matter if you burn the turkey if the drinks are on point. 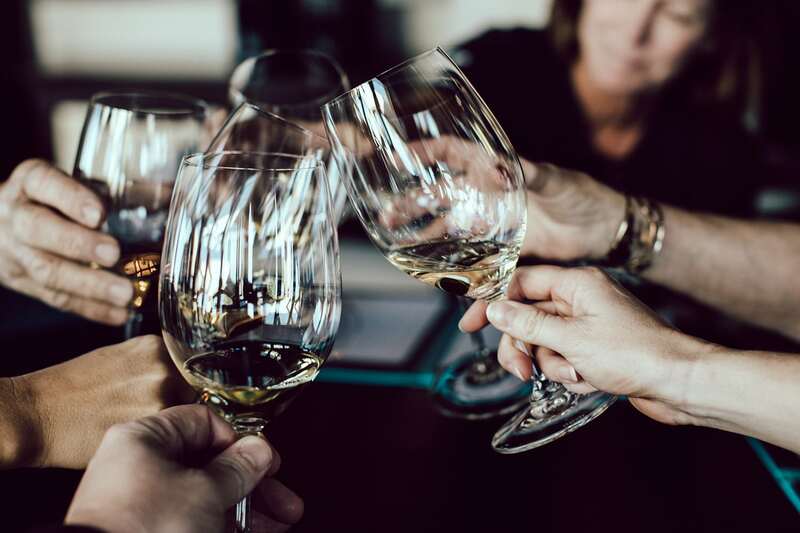 And, likewise, it doesn’t matter if you’re Ina Garten if you run out of wine at 7 p.m.
Of course, if you try to provide a fully stocked bar, you can easily drop hundreds of dollars on booze. And there’ll still be that one friend who’s annoyed you don’t have his favorite seasonal cranberry shandy. Instead, pick up a bottle or two of wine you love then ask everyone to bring their preferred beer or wine. Use an online wine calculator to estimate out how much wine you’ll need, based on the number of guests and the length of the party. On a tight budget? Buy cheap boxed wine and pour it in a decanter before the party. Now it’s fancy wine. Burnt out on turkey? There’s no law that says Friendsgiving has to be a turkey dinner. Friendsgiving is its own holiday, so do whatever works for your group. Need some Friendsgiving ideas? Make it a pizza-delivery-and-BYOB night. Make it a whiskey tasting. Make it a brunch with fried turkey and waffles! Seriously, can someone get on that? Where’s that intern? The whole point of Friendsgiving is to catch up without the usual holiday stress and awkwardness. So if fancy dinner parties aren’t your vibe, consider throwing a Crappy Dinner Party with just one rule: Do the least. Serve your Thanksgiving leftovers. Make instant mashed potatoes. Let your guests bring canned cranberry sauce. And if someone tries to roll up to the party with chocolate turkey cupcakes with candy-corn ruffles, let them. What are your tips for throwing a great Friendsgiving?